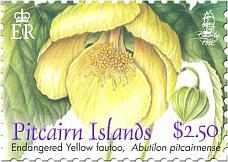 Abutilon pitcairnense was first discovered on Pitcairn in 1934 by two American botanists, H. St. John and F. R. Fosberg on an expedition from Honolulu. Further research of Pitcairn flora was carried out in 1991 via the Sir Peter Scott Memorial expedition but this, and another expedition in 1997, failed to find the elusive flower. 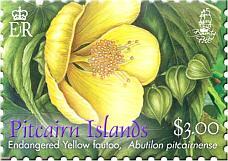 After a period of many years, during which time it was presumed extinct, the Yellow fautu was discovered as a flowering specimen in mixed native forest in July 2002 by Pitcairn resident Carol Warren. Irish botanists Noeleen Smyth and Steve Waldren, visiting Pitcairn in 2003 to study the invasive Roseapple, obtained cuttings and seed from this sole individual plant which were then sown and grown with difficulty in the Island nursery. Smyth uplifted cuttings and took them to Trinity College Botanic Gardens in 2003 and these flowered in 2005 but no seeds were obtained. A cutting was transferred to the National Botanic Gardens in Dublin in 2008 for propagating and flower buds first appeared in 2009. In 2005 the original plant at Tedside was destroyed by a landslide, so more cuttings were distributed to other botanic gardens such as Kew to ensure their long-term survival. The project to restore this endangered plant is funded by the Mohammed Bin Zayed Conservation Fund and it is hoped to experiment with the seeds produced. The conservation project is ongoing and a positive outcome for this rare plant is planned. Through combining invasive species control, restoration of native vegetation and the proposed reintroduction of Abutilon pitcairnense to various parts of the Island, a planned approach to target species conservation and restore the endangered associated habitat is underway. Plants have been returned to Pitcairn to re-establish a population in the wild and a site at Big Rock near Pulau was the first to be developed. Abutilon pitcairnense remains listed as a critically endangered species (IUCN 2000). The plant itself is described as a sprawling shrub, approximately 1M tall with alternate leaves 13 x 9cm.The flowers are somewhat bell shaped and appear to be nodding. They are yellow with 3cm long petals. The plant is found in scrub on often unstable slopes, and flowers in July / August. 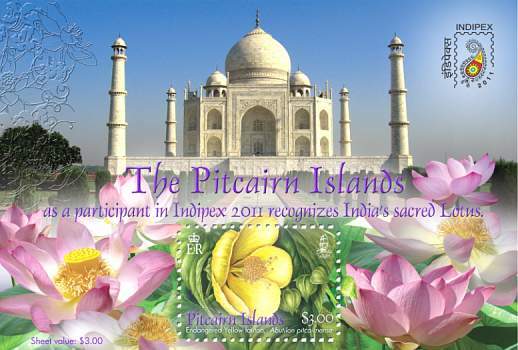 To commemorate the attendance of the Pitcairn Islands Philatelic Bureau at the International Stamp Exhibition in Delhi in February (Indipex 2011), a miniature sheet has been produced featuring important images from both locations. 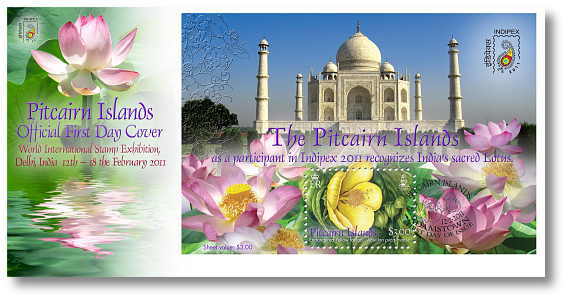 India is represented by the national flower Lotus Nelumbo nucipera gaertn and the internationally known Taj Mahal, while Pitcairn is represented by the endangered Yellow fautu Abutilon pitcairnense. Both flowers have been brought together in this colourful miniature sheet. 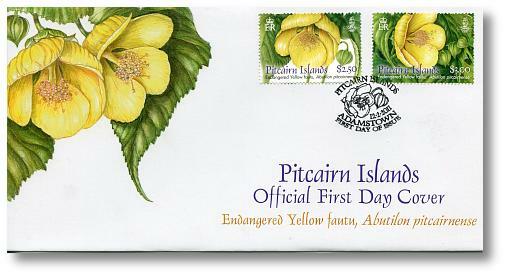 Acknowledgement: The Pitcairn Islands Philatelic Bureau would like to recognise the invaluable help of Noeleen Smyth in making this issue possible.